Pregnancy complications. What to do? What to do if you have had a miscarriage or another complication has taken place and caused adverse previous pregnancy outcome? About 30% – 40% of the pregnancies end with zygote or early (или immature — не знаю) embryo death, while 10% – 15% of the pregnancies abort at a later stage (miscarriages, stillbirths, etc.) or lead to the birth of unhealthy babies. Despite the significant progress that was achieved recently within different areas of obstetrics and gynaecology, the problem of adverse pregnancy outcome remains far from its solution. The problem is aggravated by the fact that the women who have suffered adverse pregnancy outcome are at high risk of recurrent adverse outcome of the forthcoming pregnancy. Adverse pregnancy outcome of any genesis evokes a strong psycho-emotional response in potential parents, and the doctor's function is to find the cause of the failure and to conduct reasonable pre-gravidic preparation aimed at maximal ensuring normal course of the forthcoming pregnancy. That is very difficult to achieve. Some recommend trying another pregnancy without any examination and preparation. Others recommended undergoing medical examination to avoid recurrent adverse pregnancy outcome. So, what has to be done? It is essential to understand that pregnancy loss is always the result of existing abnormalities in a woman's body. On the other hand, the main goal is not the pregnancy itself but the birth of a healthy child. One can well get pregnant, but give birth to a weak, premature or sick child with congenital diseases and malformations. Is it a good idea to jeopardize your unborn baby if you have been already warned by nature that something is wrong with your health condition and that there is a risk of recurrent miscarriage or birth of an unhealthy child? The answer is obvious — you need to have medical examination and pre-gravidal preparation done for you to prepare yourself properly for the forthcoming pregnancy. However, to identify the cause of miscarriage is quite difficult, and sometimes impossible. When doing so, a large number of laboratory tests and diagnostic procedures are conducted and a lot of time and material resources are spent, and still the cause of miscarriage can be not identified. Thankfully, advanced technologies are coming in the stead: just a single “ELI-P-Complex” test can answer whether a woman's body is ready for pregnancy or she needs to undergo treatment. A large number of clinical studies indicate that the “ELI-P-Complex” test enables predicting pregnancy outcome, as well as preventing premature childbirth and such complications in newborns, as neurological disorders, diabetes, congenital disorders. There is evidence that women, who previously had pregnancy complications, have 5 — 8 times more frequent satisfactory course of forthcoming pregnancy if the «ELI-P-Complex» test was applied during pre-gravidic preparation. More than 70% of the children examined at the age of 4 — 6 years and rated as generally healthy were born by women with normal «ELI-P-Complex» test results. As contrasted to just 15% of the children rated as healthy, who were born by women with abnormal «ELI-P-Complex» test results. Clinical research that involved 7296 women aged from 17 to 45 shows clearly that applying the «ELI-P-Complex» test during pre-gravidic preparation enables 18 times decrease in miscarriages and premature births frequency, 9 times decrease in pregnancy abortion threat and 10 times increase in probability of birth of a healthy child. And finally. It is known that rubella, influenza, measles, mumps, and other infectious diseases, if contracted during early pregnancy, may affect the pregnancy course and the embryo and foetus formation in 20% – 40% of cases. Having recovered from such a disease you may want to decide whether to keep the pregnancy or to terminate it, as the infection could cause irreversible damage to the child. Of all the methods existing for today only “ELI-P-Complex” test enables unbiased assessment. Case Study 1. In her 1st – 2nd week of pregnancy, patient P. was in contact with a child ill with measles. No clinically significant signs of the disease were observed. In her 5th week of pregnancy, according to the «ELI-P-Complex» test results the patient had light deviations in embryotrophic antibodies content. 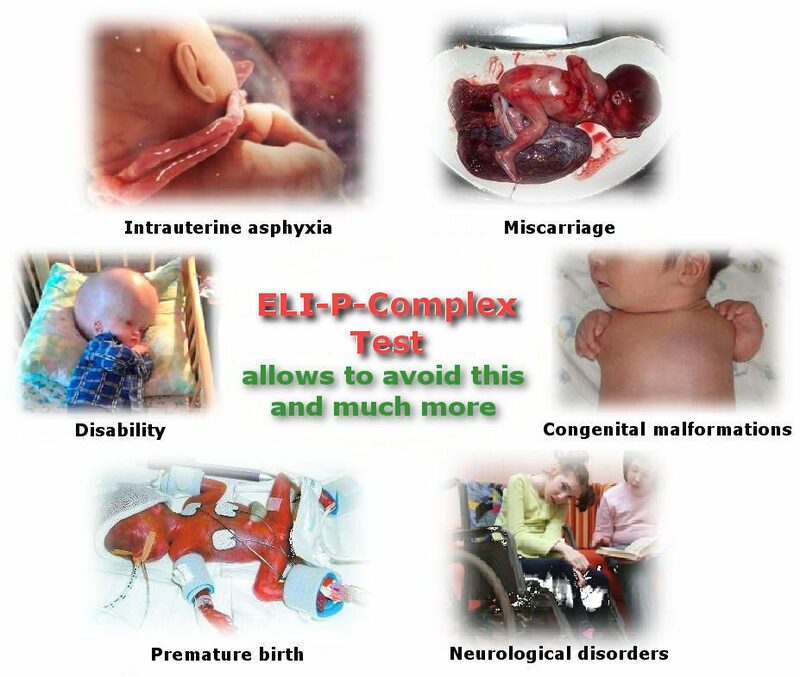 In her 9th week of pregnancy, drastic aggravation of the «ELI-P-Complex» test results was observed. Under advice of her obstetrician-gynaecologist she had therapeutic abortion in her 10th week of pregnancy. Case Study 2. Patient K. was ill with flu in her 2nd – 3rd week of pregnancy. Her body temperature was above 38.5° C for 3 days. In her 6th week of pregnancy, according to the «ELI-P-Complex» test results the patient had deviations in embryotrophic antibodies content. Her obstetrician-gynaecologist advised therapeutic abortion. In her 10th week of pregnancy the «ELI-P-Complex» test results came back to normal. In her 16th week of pregnancy the specific antibodies indices were within the norm. Under immunologists advice, the patient refused abortion flatly and gave birth at term to a healthy newborn. Paediatrician's and neurologist's follow-up examination revealed no abnormalities in the newborn. And your forthcoming pregnancy can be safe, if you have «ELI-P-Complex» test done. You can book your appointment here. More information about ELI-P-Complex Test you can see here.